The top ten herbal remedies are the ones most popular with the public. They provide a more natural alternative to drugs, and are often worth trying (but if you are on medication, check first with your doctor or a medical herbalist that you can take them). Arnica: the Arnica flower is native to the Alps but its qualities for healing bruises have been recognised for many years. It cannot be taken as a herb internally but is available as a homeopathic tablet. Arnica Gel or cream is excellent for healing bruises and also for soothing stiff joints, aching muscles and osteoarthritis. Devil’s Claw (Harpagophytum): found in the Kalahari desert the natives have traditionally used this herb for digestive complaints. It has powerful anti-inflammatory properties and is therefore very suitable for arthritis, rheumatism and sports injuries. Fears that the herb would become extinct have been alleviated by schemes to grow it sustainably in southern Africa. 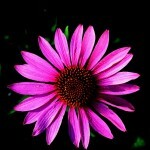 Echinacea: taken as a tincture or tablets it boosts the immune system. The native Indians have used it for thousands of years to put on snake bites and other wounds. More often used now to help resistance to colds, flu and other infections, but has been proven in trials to be effective against respiratory infections. Ginkgo biloba: from one of the oldest trees in the world the Ginkgo tree was one of the first prehistoric plants on the earth over 150 million years ago. Best known for enhancing circulation and thereby improving the memory it has other uses too. The leaves are used to make tinctures to improve circulation and the function of the brain as well as asthma. The seeds are used by Chinese doctors for urinary problems and wheezing. Read more in Boost Your Memory. Horse Chestnut (Aesculus): good old conkers that so many children enjoy collecting have another use – they have excellent properties as an astringent to help to prevent and soothe varicose veins. It can be taken as a tincture or the gel can be rubbed into the legs. St John’s Wort: has become a popular choice for depression but people have to be careful about taking it in conjunction with other medication or even with light boxes (that are used for Seasonal Affective Disorder – see Features, SAD). Also known as Hypericum which is used as a cream to heal wounds. 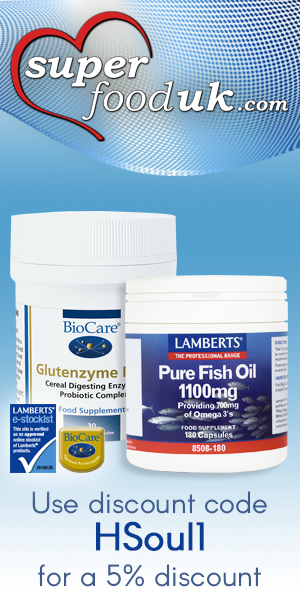 is widely available through health food stores, chemists and at Nutricentre (see the Nutricentre ad). If you are taking medication you should always check with a registered medical herbalist or your doctor before taking herbs to ensure that they do not contraindicate. Milk Thistle: protects the liver from toxic chemicals and is often useful around Christmas when over-indulgence is the norm. It is sometimes used when people have liver disease but can’t be used as a cure-all for heavy drinkers! It was called Milk Thistle because it was taken by nursing mums to help encourage the flow of milk. Sage: is particularly recognised as being helpful for hot flushes. You can gather some leaves from the garden, put them in a teapot and sip them if you are going through the menopause or purchase a tincture or tablets. It is also helpful as a gargle for sore throats. Saw Palmetto: originating in North America saw palmetto has been used by native Americans for thousands of years to help ease chronic congestion. Recent research has shown it to be effective for prostate problems in men without the side-effects of prescription drugs. Valerian-Hops: 19th century poets and other creative types were known to use Valerian. Combined with unpollenated hops which are renowned for their calming qualities it is a useful herb for helping you sleep or for generally calming down without making you feel dopey in the day. To order these products go to www.superfooduk.com. and put in the promotion code: HSoul1 for a 5% discount. Before you head out for a workout make sure you stretch properly before. This will let your body prepare for exercise and will also warm you up which is important to avoid muscle soreness and injury as cold muscles mean tense muscles, which can lead to an increase in muscle tear. Sore muscles are caused by the filaments in muscle fibres tearing and the breakdown of muscle tissue. Don’t panic though, this may sound scary but it’s perfectly normal, it’s just our body’s way of adapting to exercise. Injury may come about when you’ve suddenly increased your workouts or mileage, which is a common mistake and stresses the importance of pacing yourself and stretching. Taking on enough fuel for your workout is also important. Avoid eating a hefty meal before training, so that you’re not trying to digest and train at the same time. It’s better to eat a few slices of malt loaf and a banana at least an hour before training, to release energy slowly and keep you going. Play it safe when working out and listen to your body, keeping an eye on any niggles that crop up. Pain is a signal so find out what it means before carrying on and risking further injury. Always find out what the pain is and why it’s happened so you can take steps to prevent it from happening again. If you get a stitch while working out the best thing to do is focus on your breathing. Take deep breaths in and out. To reach optimum fitness, target different muscle groups so you’re working your upper and lower body. Use gentle weights or try boxing programmes to work your upper body and do squats and lunges to strengthen your legs and you’ll find this will make a real difference to your fitness. When you’ve finished your workout make sure you do gentle, long stretches. This will allow your muscles to recover from the shock you’ve just put it through. Make sure you eat well post-workout as this can have major benefits on your fitness performance and can be the difference between getting that personal best and hitting the wall. Eat plenty of magnesium rich foods like nuts, seeds and wholegrains. They will allow your muscles to work efficiently and recover properly. If you’ve had an intense workout it’s vital to refuel afterwards with good quality protein. Chicken with vegetables and pasta is a good post-workout meal and a tuna and salad sandwich can help you recover after a lunchtime run. If you find your aching muscles are getting you down, pour yourself a warm bath with some bath salts to help soothe your muscles, or book yourself in for a massage. Rubbing A.Vogel Atrogel into sore muscles can also help relieve aches and pains caused by workouts. It smells pleasant and is quick drying and can be applied up to four times a day so can be a great alternative to reaching for pain killers. A.Vogel Atrogel contains Arnica, a herb which, when freshly harvested, is full of lactones. The lactones interrupt the inflammatory process right at its inception, preventing the production of inflammatory chemicals. 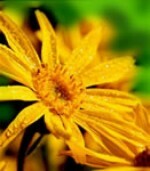 Well known for its relief for bruising Arnica can also soothe muscular aches, pains and stiffness, and sprains. A. Vogel Atrogel costs £9.65 for 100ml, and £6.35 for 50ml – click here to purchase from the Nutri Centre. Alison Cullen is a nutritional consultant at Bioforce UK (A. Vogel). It was one of those days we’ve had a lot of this summer – bursts of sunshine punctuated by downpours. When the sun came out the colours of the herbs came into their own – the brilliant orange of marigolds, bright red poppies, and beautiful lavender flowers laced with the aromatic scents of sage, rosemary, and thyme. Above all there was an overwhelming sense of tranquillity only gently disturbed by birds, bees and the occasional rabbit hopping around. The scene is Weleda UK’s 15 acre plot of herbs near Ilkeston in Derbyshire where the natural health products company grows over 300 species for use in herbal and homeopathic remedies, toothpastes, shampoos, lotions and potions. Growing its own ensures freshness, availability and sustainability. The Derbyshire rabbits aren’t too popular with Weleda’s head gardener, Michael Bate, because they dig up whole plants to get their food. But rabbits aren’t the major threat to the planet’s herbs – we are. A report by Plantlife International, the wild plant conservation charity, claimed that the £11 billion global herbal medicine industry is causing some 4,000 to 10,000 herbs worldwide to become endangered. Unfortunately the majority of the herbal medicine industry is not doing their bit to ensure survival and Weleda is one of just a few natural health products companies growing its own and buying from sustainable sources. An astonishing 80 per cent of the world’s population relies on herbal medicine as their primary healthcare. There are several reasons for this but principally the cost of drugs is far beyond the reach of many of the world’s population as is currently demonstrated by the lack of availability of retroviral drugs for AIDS in Africa. In many cases though local cultures have a long tradition of using herbal medicines that have served them well over the years and which are easily available and cheap. In the UK alone we spent a huge £87 million pounds on herbal remedies in 2004 (Source: Mintel), an increase of over 56 per cent on 1999, with no let up in annual growth. All kinds of herbs traditionally used by medicine men, native tribes and Indian and Chinese doctors are now available on the shelves of our local health food store. While many of us applaud ourselves for embracing a natural lifestyle the report by Plantlife claimed that two thirds of the 50,000 medicinal plants currently being used in the herbal industry are harvested from the wild and herbalists talk of varieties which are no longer available at all. The environmentalist, David Bellamy, is President of Plantlife, the Conservation Foundation, and Patron of the Natural Medicines Society’s Herb Alert campaign which in his words aims ‘to put herbal medicine back where it deserves to be, an important part of mainstream healing practice in the 21st century’. Both environmental organisations aim to encourage the adoption of cultivation projects to enable the planet’s plant heritage to be sustained. Growing herbs in a sustainable way to ensure that precious species continue not only protects the future of herbal medicine, but it ensures the survival of local communities who depend on the trade for survival. It is almost impossible to police the harvesting of herbs around the world unless communities choose to do it themselves or herbal companies set up sustainability projects. The Sioux Indians of the Lakota tribe in South Dakota have used Echinacea for hundreds of years to fight off infection and to heal wounds and snake bites. When they collect the plants in order to prevent extinction they never pick the first one they see in case it is the only one left. Unfortunately not everyone has such high ideals and Echinacea is being illegally harvested even in protected areas in the US. Endangered herbs cited in Plantlife’s report, Herbal Harvests with a Future, include Arnica, popularly used in homeopathic remedies for bruising, Goldenseal prescribed for digestive problems and wound healing, American Ginseng, traditionally an aphrodisiac but now more dispensed to boost energy levels, and Liquorice, often used in herbal and conventional medicines for stomach ulcers. Commonly known kitchen herbs Oregano and Thyme are also being overharvested in some areas for their medicinal properties. Most herbs grow easily in different climates and Echinacea thrives even in the UK, but some of the most endangered species require considerable expertise, perfect soil conditions and the right climate. And many of them take several years of nurturing before they are ready to harvest. The report by Plantlife was critical of UK herbal manufacturers because most of them buy from unsustainable sources. It also claimed that whenever there is a shortage of a particular herb, some companies buy plants on the open market which have invariably been picked in the wild without concern for sustainability, often because poor communities depend on them for their livelihood. . The kind of project environmentalists are keen to see has been adopted by Swiss herbal manufacturer Bioforce which grows most of its own herbs in Switzerland and claims to run out of stocks rather than buy on the open market. Bioforce used to buy Devil’s Claw on the open market but they recognised that random harvesting would soon cause extinction since a drastic 15 million plants are being pulled up out of the Kalahari Desert every year. The clamour is all for the plant’s tuber, traditionally used by local tribes to treat digestive problems but now valued in the west as an anti-inflammatory for arthritis and other joint and muscle pain. According to Bioforce UK’s Medical Director, Jen Tan, ‘Because the local tribes are poor and exploited by merchants they try to get as much as possible from the plants which are hard to dig out of the desert. There are encouraging signs that the industry is getting its act together slowly and in the last few years UK company Viridian launched its own range of 20 organic herbal tinctures, home growin in Herefordshire, including Echinacea, Ginkgo and Motherwort. However, if progress is going to be made herbalists and consumers have got to be willing to buy from responsible suppliers. The National Institute of Medical Herbalists (NIMH) is drawing up guidelines for its 700 members advising that they only use herbs from sustainable sources. The NIMH also favours wildcrafting – picking from the wild only where they know that herbs are not endangered. Herbalists may also take note of the recommendation from the World Wildlife Fund (WWF) that more common herbs are substituted for the rare ones, such as using Calendula from marigolds instead of Goldenseal. The Plantlife report proposed that eventually there would be a kitemark system so that shoppers would know which herbal remedies were made from sustainable sources and select products in the same way that they can buy dolphin-friendly tuna. The EU’s Traditional Herbal Medicinal Products Directive was adopted by the European Parliament in March 2004 and came into force in the UK on 31 October 2005. In order to get their products registered herbal medicine manufacturers have until March 2011 to produce a dossier that proves the efficacy of the remedies, using evidence of traditional use, or they will not longer be able to sell them in the EU. ‘It is extremely expensive to produce these dossiers,’ claims Bioforce UK’s Quality Assurance Manager, David Belshaw, ‘Larger companies like ours are much better placed than the smaller ones who may find that they need to get other companies to manufacture on their behalf. For those that don’t seek partners the future is bleak. This may be good news for consumers who will know that products have undergone stringent controls, but The Directive does not affect medical herbalists who do not usually buy herbs off the shelf. Echinacea – infections, colds and flu, snake bites! Weleda, Bioforce and Viridian products are available at Nutricentre – click on the green ad.